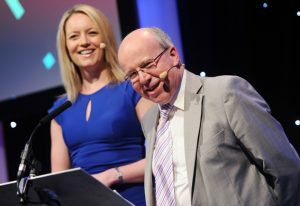 Jim co-hosts the Prolific North Awards with BBC North West presenter Beccy Barr. A good host is crucial to an event’s success and Jim Hancock’s experience and professionalism can make any occasion go well. Recent highlights of Jim’s hosting work include a national conference for the HS2 Industry Leaders Group attended by Lord Deighton and Sir David Higgins; the global BioInfect conference on antibiotic resistance supported by AstraZeneca and Redx Pharma; the Fracking North conference; and this summer he will chair the UK’s first Neuro Business conference. For a more comprehensive list, see the table below. You can see the feedback left by previous clients he has worked with on the testimonials page. At a recent Runways UK conference, under Jim’s questioning, Sir Howard Davies, head of the Airports Commission, expressed his frustration at the government’s delay in making a decision on Heathrow or Gatwick getting an extra runway. This made the City Diary column of The Daily Telegraph in December 2014.